Ladder Inspection There are 8 products. 2 x Permanent Marker Pen for writing on Clow Inspection Tags. Availability: In-Stock. Self Adhesive Clow Inspection Tags provide a simple visual check of an item of equipment's last inspection date and next due inspection date. 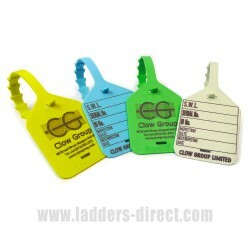 The high tack adhesive backing of these tags ensure they remain glued to the ladders, steps and towers. 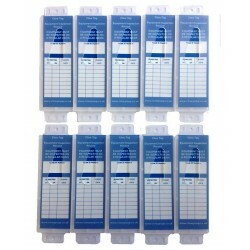 Pack of 10, supplied as individuals tags, dimensions 156mm x 50mm. Availability: In-Stock. 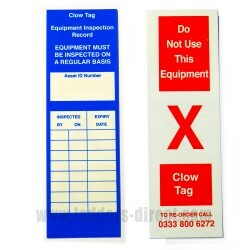 10 each of Clow Inspection Tag Holder and Clow Inspection Tag Inserts. Clips shut and securely holds the Inspection Tag in place. Availability: In-Stock. Clow Inspection Tag Holder for fitting to equipment. Clips shut and securely holds the Inspection Tag in place. Pack of 10 Availability: In-Stock. Clow Lifting Inspection Tags offer a safe, compliant, and practical solution to Lifting Equipment inspection and identification. Pack of 10 Availability: In-Stock. Self Adhesive Clow Inspection Tags provide a simple visual check of an item of equipment's last inspection date and next due inspection date. 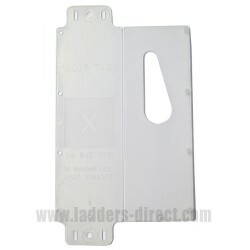 The high tack adhesive backing of these tags ensure they remain glued to the ladders, steps and towers. 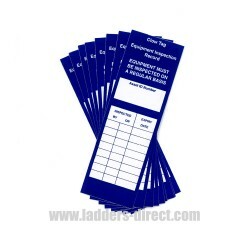 Pack of 50, supplied as individuals tags, dimensions 156mm x 50mm. Availability: in-Stock. Clow Inspection Tags provide a simple visual check of an item of equipment's last inspection date and next due inspection date. Pack of 50 Availability: In-Stock. Clow Inspection Tags provide a simple visual check of an item of equipment's last inspection date and next due inspection date. Pack of 10 Availability: In-Stock.